Most importantly – the diffusing material. I used a very thin cutting board that I found at the local supermarket. You might also be able to use: A piece of a white, translucent shower curtain, a thin white plastic bag or a piece of white silk. What’s important is that whatever material you use, it has to be white and let some light through. A few cereal boxes – if you have any that are white on the inside, it would be better than the natural colored ones that I used. Some black tape – for that professional look. You also need a ruler, a utility knife or scissors and a pen or pencil. 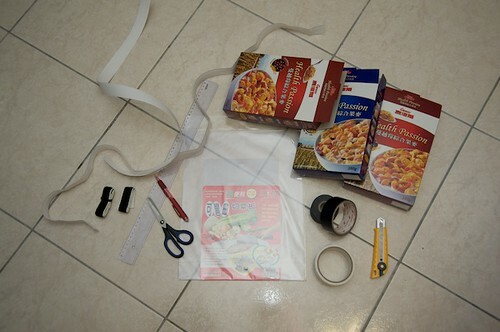 Al the materials you're going to need to make a DIY soft box: Diffusing material (a thin cutting board), cereal boxes, black tape, scissors or a knife, Velcro (sticky on one side), a pencil and a ruler. To start off, measure the top and side of you flash head. Add about 1 cm or a 1/4 in. because it doesn’t need to be that snug. Also, measure how deep it can go onto the head. 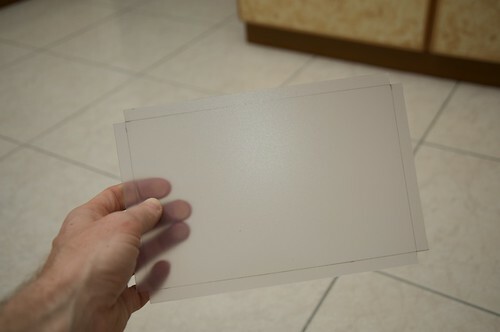 I found that 7 x 4 x 4 cm (2.75 x 1.5 x 1.5 inches) works well for a Nikon SB-800. Measuring the depth of the flash head. Draw a line through the middle of the wide side of the cardboard (at 12 cm, duh). Use this line to center the wide measurements of the flash head. If the top of your flash head is 7 cm wide, you want to measure 3.5 cm either way from the center line and make two marks. Then measure 4 cm into the cardboard for the depth and use that point to measure 3.5 cm on either side again (confusing, I know… just look at the picture and use your noodle). 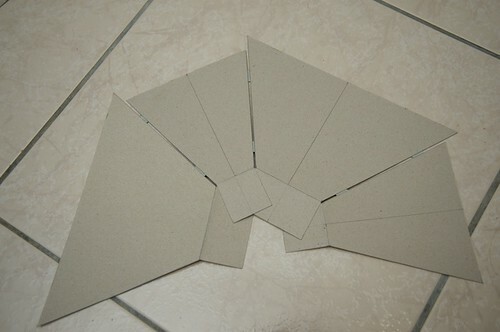 From the two corners of the new rectangle, draw a straight line to the far corners of the cardboard. Here's what the top piece should look like when you're finished measuring and drawing. If you have an SB-800 and are following my measurements, cut a rectangle 14 x 17 cm (5.5 x 6.75 inches) then follow the directions above, but make the rectangle for the flash head 4 cm wide, not 7. Take the measurement from the wide side of the piece you just made (X1). Multiply it by the measurement of the side of you flash (Y2). 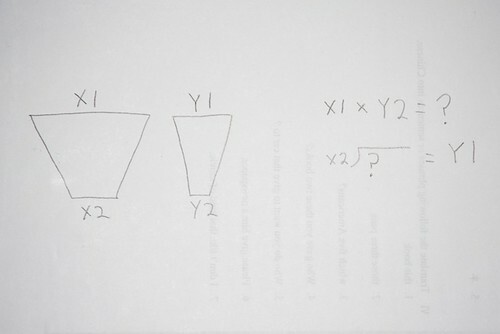 Then divide that number from the measurement of the top of your flash head (X2). This should give you the right length to make the wide end of the side pieces (Y1). Don’t let the Xs and Ys scare you, this isn’t that hard to do. Note that mine didn’t come out perfectly, but it was really close. This is a simple math equation to figure out the proper size of the sides of your soft box. Next, tape them together leaving a little space in-between each panel so it will fold up easily. When you start taping the sections together, leave a little space for some wiggle room. After it’s all together, measure the front for your diffusion material and add a little (say 3mm or 1/8 an inch). This will be the size of the front of your soft box. I’m not going t give you the measurements that I used because I cut mine a bit too small and you probably didn’t make all your measurements perfectly either, so sizes are going to vary a little. 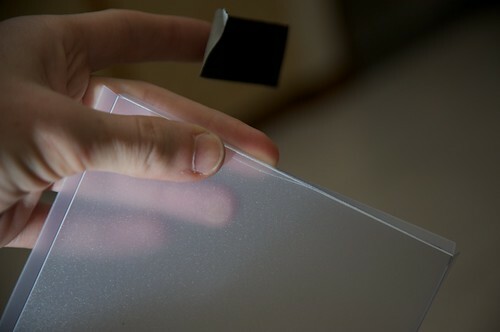 Add about 2cm or an inch to that rectangle and mark it on your diffusion material. 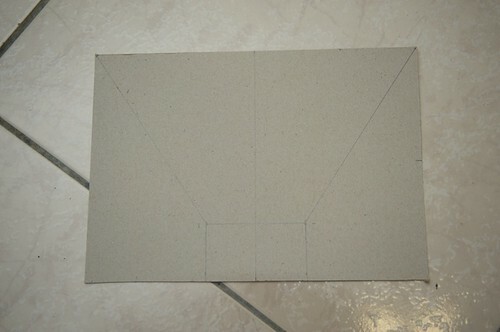 The center rectangle is same size as the front of the DIY soft box. 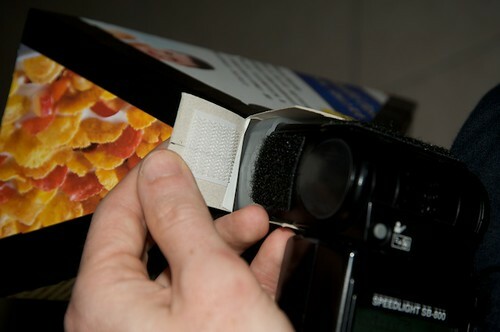 Add a little to fold it back and add some Velcro to attach it to the soft box. Cut some notches on each corner so you can fold it. Cut the corners to fold the cutting board back. I needed to score the cutting board that I was using to be able to fold it. You may or may not have to, depending on what diffusion material you use. 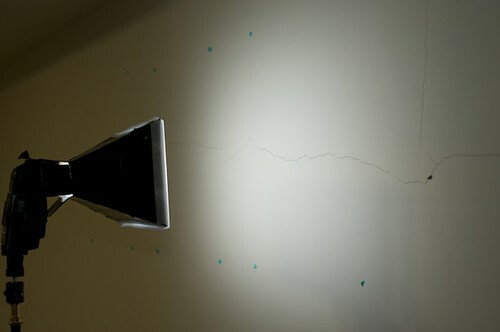 I didn’t score it enough and it cracked in one spot so I covered that with gaffer’s tape. It’s right on the edge so it doesn’t affect the light. 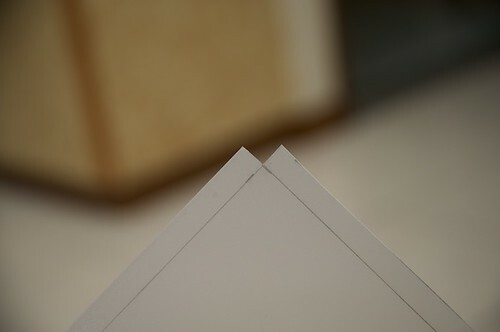 When folding the edges of my diffusing-cutting board, I cracked the edge a bit. It's not a big deal because the crack is on the edge. I just covered it with a little gaffer's tape. 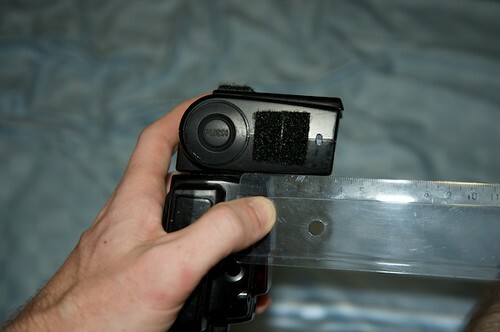 Next tape everything up and add the Velcro to the edge of the soft box and the diffusion material. Here's the DIY soft box after a little black tape has been added... almost professional looking, eh? Add a little Velcro to the back flaps, the front edges and the diffusing material and Bob’s yer uncle! I attach the DIY soft box with a little Velcro to the sides and top of my strobe. 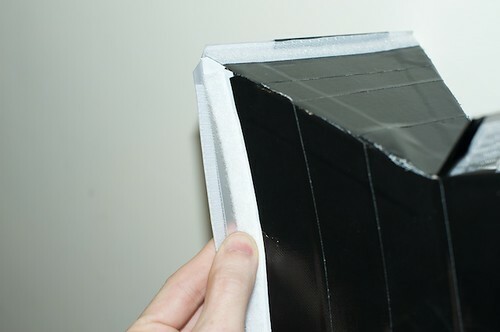 Here you can see where to put the Velcro on your DIY soft box. 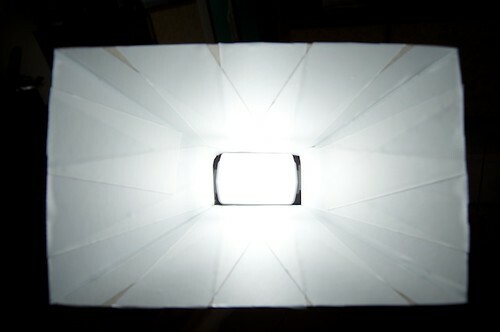 A look at the distribution of the light through the front of the DIY soft box. If you’re careful about all those measurements, you should be able to fold it up. 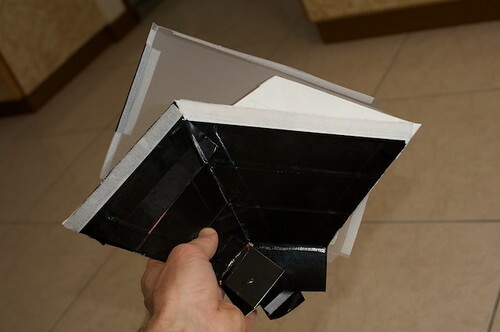 If done properly, this DIY mini soft box should fold up. Here’s a picture without the diffusion material on the front. Note that it’s a really good idea to always use a dome diffuser on your flash when using a soft box like this. 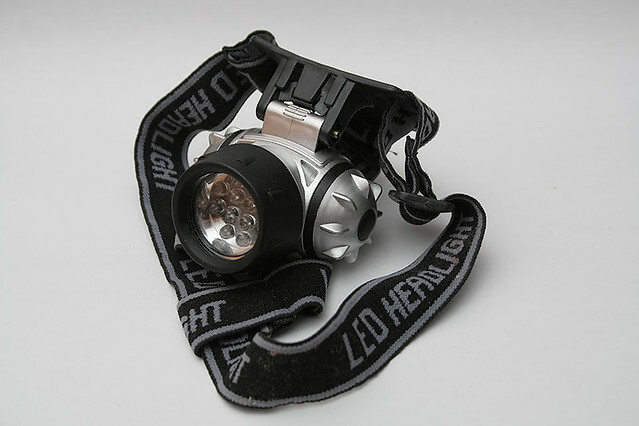 If you don’t have one, be sure to set the flash head to its widest setting. Also note that I used white tape that I had lying around to make the inside of the box white. I think this also helped to make the soft box a bit stronger, but you could also use white spray paint… Just get the inside white so that it reflects a much light as possible. This is a look inside the soft box without the diffusion material on the front. I used some white tape on the inside but you can spray paint it and probably get a nicer look. Note that the diffusion dome that came with the Nikon SB-800 is attached to the flash. If you have one you should definitely use it. If not, set the strobe to it's widest setting. Here’s a picture of the quality of light coming through the soft box as seen on a white wall. Here's a look at the spread of light on a white wall... Nice and even! And here’s a comparison of the effect on a small subject. 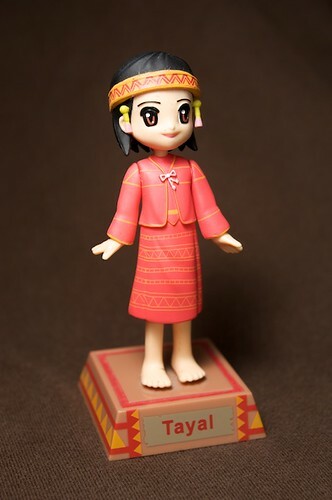 This is a macro photograph of a small doll using direct flash. Note the harsh highlights and shadow in the background. 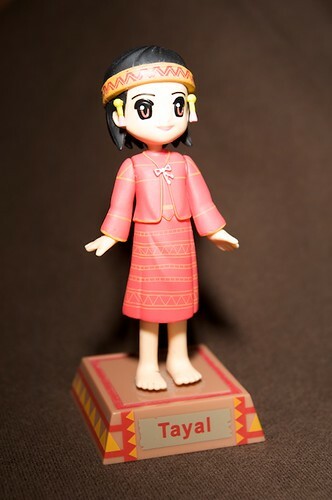 This is a macro photograph of a small doll using my DIY mini soft box. Note the harsh highlights are gone from the doll's face and the shadow in the background is much more pleasing. Note that these small soft boxes aren’t going to help soften the light if your subject is more than a few feet away, but they’re great for macro work and close portraits! Also have a look at my blog about general DIY Photography Gear. Great tutorial. Send a link to David Hobby – he’d probably like it. Cool, thanks for giving me something to do this weekend! Thanks guys. Good idea Craig, I might do that. This is a good and pretty interesting idea! Did the office paper cause you too lose a lot of light? Didn’t think about that and didn’t measure it. Will do when I have time, although as I don’t want to untape the paper from it (it takes some time to get it in place), I can now only compare flash with the diffuser and the softbox. Light loss is not of much concern for me, as the softbox of this size is normally used from pretty close distance and then it does not really matter. On the next one (LED 004) there is bare flash into the ceiling with 1/4 power. Looking at the background we see that it is a bit more exposed. So we can roughly assume that softbox with office paper diffuser eats a little over 2 stops of light compared to bare flash. 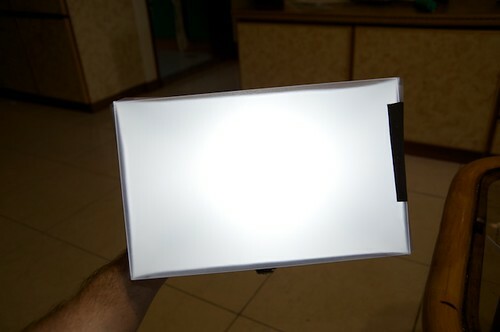 Pingback: lighbox (softbox?) with detergent container?? Good job. I need to start saving money and this is a great homebrew idea. Thanks for the post. 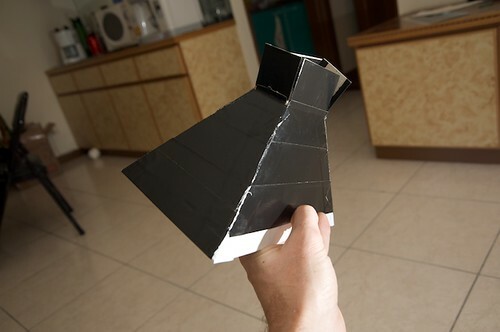 I just followed along and built one of these out of UPS Letter envelopes. It took about an hour or so. I used the white areas of the envelopes to cover the insides of the box. It makes a significant difference in the close shots. Thanks Rhuel, glad to hear it worked out! Hi. Going to reproduce this (with my own words), on wikiHow.com. It gets a lot of visitors and I will use your site as a resource. I will use my own images as well. I reproduce articles while creating the project. Fantastic job!